The development of our popular Salon Skin Range, was inspired by the many day-to-day skin concerns our expert therapists faced in the treatment rooms. And thus the range is specifically formulated to help treat and restore those specific everyday needs of your skin. The range includes ingredients that are recognised and sought after in the skincare arena. It combines essential oils (Lavender, Geranium, Grapefruit & Tea Tree), advanced actives (Salicylic Acid) and highly concentrated vitamins (A, C & E) for that salon skin result. Our Sorbet Grande Facial uses many products from our Salon Skin Range and is a must try if you’re after that salon glow. 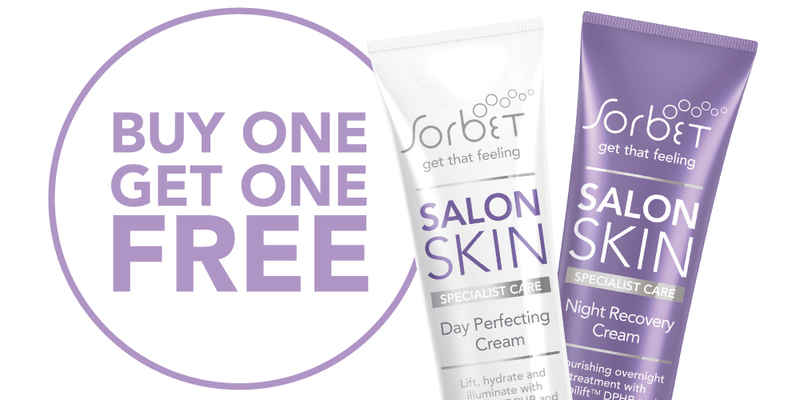 Because we love your skin and we really want you to try our Salon Skin range, this July, we’re offering a ‘buy 1 get 1 free’ deal on our Sorbet Salon Skin Day Perfecting Cream and our Sorbet Salon Skin Night Recovery Cream. Get both products for R200 (save R200)! This little baby will nourish your skin while you’re sleeping. Let it do all the hard work while you get your much needed beauty sleep. Ts and Cs Apply- Sorbet has the right this promotion at anytime. This special excludes any current specials, discount vouchers and facial combos, promotion ends 31 July 2016!